Whether you're celebrating Independence Day in the summer, New Year's Eve in the winter or any other holiday in between, there's no denying that sparklers add something special to the party. 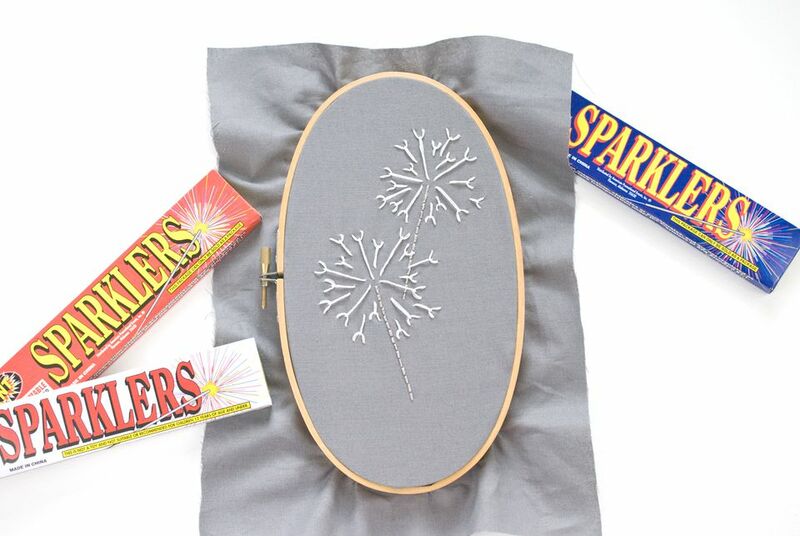 These embroidered sparklers are totally safe and they last much longer! You won't need a pattern to stitch sparklers because you only use two simple stitches to create custom designs. To make them extra special, pull out some specialty threads. Metallic floss is perfect for the stem and you could use that for the sparkles too. But why stop there? Grab some glow-in-the-dark embroidery floss and your stitching will light up the night. Specialty threads are optional, but they do make this easy project really stand out! Start your sparkler with a straight line of back stitch in silver metallic thread. To avoid metallic stitching headaches, use these best practices. The stems of my sparklers are about 3in long. Next, thread your needle with glow-in-the-dark thread. There are several types of glow thread, and similar to metallic thread, they require some extra care. Thread Heaven is a good start for all types. The type I used worked well when I treated it just like the metallic thread. Stitch a base of five somewhat evenly spaced extra-long fly stitches. Making these is just like stitching standard fly stitch, but instead of a tiny stitch to hold down the "v", the tacking stitch is extra long. Mine are nearly 1in. When working with stiff specialty threads, you'll find the top of the stitch doesn't have much of a point, unless you pull it very tight. It's better to have rounded stitches with even tension than to have bunchy fabric. With the base in place, start filling in between the long "sparks" with more fly stitches in different sizes. These stitches are what will make each of your sparklers unique. You can add one to three smaller stitches between each of the large stitches. Placing some of them out and away from the center mimics how real sparklers send off sparks. If you want to add even more, try some straight stitches coming out around the edges or trailing down toward the stem. You can add more sparklers to your embroidery and then frame it for display. Your glow-in-the-dark threads should pick up enough light from the room, but to really give them some glow power, hold the embroidery near a light bulb for a minute or two. When you turn out the lights, you'll see your sparklers really shine! These would be fun to hang in a child's room so they can enjoy some celebration sparks the safe way!